The (5V) will be connected to the 5V pin on the expansion dock and the ground to GND. This will, of course, be replicated for each of the 8 switches. I know very little about electronics, so I'm hoping that I can get some input on this. Am I missing anything? I was planning on using pins 0-3 and 6-9 on the expansion dock as they aren't labelled as anything else -- will that work? If this is not an appropriate place to get help with this, is there a better forum? I'd like to move ahead with this, but I don't want to fry my onion either. So, I don't think that circuit is going to do what you want. I see you have a voltage divider comprised of 51K and 5.1k. What will happen is the higher GPIO input resistance makes it possible for much higher then 3.3v to be present at the GPIO pin, especially when no current is flowing. What you want to do is create a voltage divider to ground configured in such a way that the voltage to the pin will never exceed 3.3v, but really anything over 2.8v is good enough. Something more like this drawing. Also, take care with the pins you hook up to, many of the GPIO need to be left floating at boot. It might make more sense to use a MCP23008 DIO expander to monitor the inputs instead of direct to the Onion. Originally that GPIO was an ATmega328P pin.That two resistors are not a voltage divider. The 5.1 kOhm is a current limiter. As you know the GPIOs of Omega2 are not 5 V tolerant but - with this circuit - Omega2 most probably will not damage (immediately ;-). OP should connect the 51 kOhm resistor to 3.3 V.
@Roger-Sinasohn There are only seven (7) "free" GPIO Inputs on the Expansion Dock's Expansion Header for this circuit. After the next commands you can use GPIO 0, 2, 3, 6, 18, 19, 46. The GPIO's of Omega2(+) are not 5 V tolerant - so you should connect the pullup resistors to 3.3 V.
I take it I can't just use those? I would really like to have 8 inputs if at all possible. @György-Farkas @Jeff-Seese -- I didn't realize that the circuit I found was meant for the arduino; will it work if I connect it to 3.3v instead of 5v? I think Jeff's circuit is very similar but has different resistor and capacitor values to account for the 5v. Given that the expansion board also has 3.3v available, what values would I need to use? I apologize for the basic questions; I'm a software guy by trade, where on is on and off is off and there's no ambiguity and nothing in between. I you are using 3.3v then the schematic I sent you will work if you leave out R2. @Roger-Sinasohn You can't use GPIO7, 8, 9 and 1 with this circuit. GPIO7, 8 and 9 (header pins 19, 17 and 15 respectively) together is the SPI interface - so these pins are mandatory of the system. GPIO1 (pin 23) has a 4.7kOhm pull-down resistor under the shielding so - using this circuit - this Input is always Low independently of the push button's state. What does '8 momentary sw.' vs. '4 SPDT sw.' mean exactly? Perhaps I didn't word that correctly... I'm using 4 physical switches, each of which, being a SPDT, has two independent logical? switched. That is, push the lever forward, that's one input; pull it back and that's another. It sounds, however, like I can only have 7 inputs? You mentioned GPIOs 0, 2, 3, 6, 18, 19, and 46. There's no way to get an 8th? Note: I also want to use the SDA/SCL to hookup an LCD, but I don't think that's a problem. @Roger-Sinasohn If I understand well instead the 8 normally open momentary pushbuttons (see the upper layout) you want to use 4 SPDT switches (see the lower layout). Sorry, I can't follow you. Could you explain what do you want to make? More details or a little schematic would be nice. 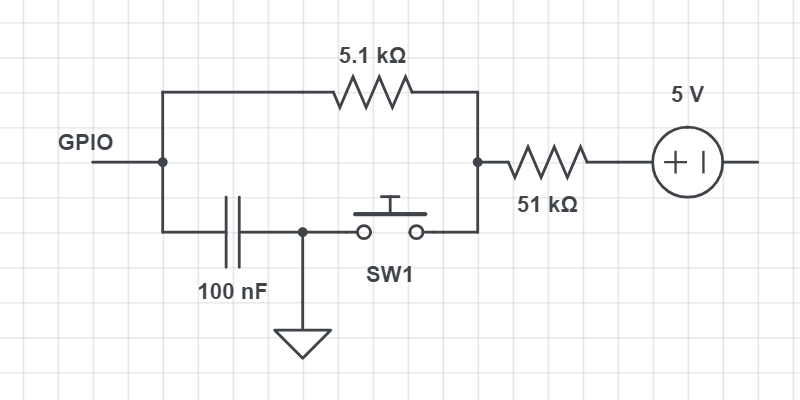 I'm using 4 physical switches, each of which, being a SPDT, has two independent logical? switched. What are you talking about please? display "switch 1 was pressed!" display "switch 2 was pressed!" The toggle switch should be functionally equivalent to 2 pushbuttons. The main different between what I'm using ant the toggle switch you showed is that there is a middle "off" position. Note that for each of those switched, the normal condition is in the middle, not connected to either output.